Though the game of football has seen many great goalkeepers over the last cen-tury, one name still stands head and shoulders above everyone else. We are, of course, talking about Lev Ivanovich Yashin, one of the most beloved football figures in the USSR. Thanks to his trademark all-black uniform, Yashin was known by many different nicknames, such as the Black Spider, Black Octopus, and Black Panther. 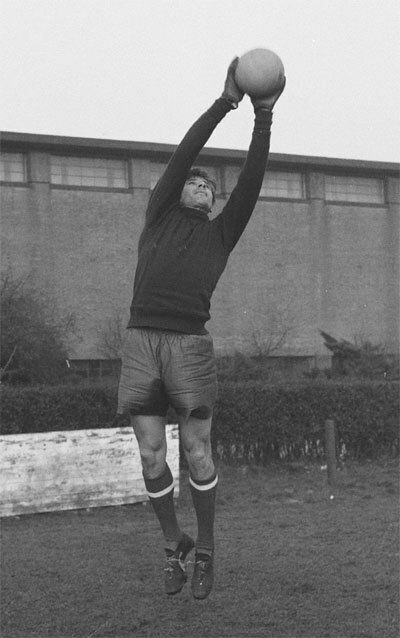 The goalkeeper at training in 1960. Yashin's early life was far from a walk in the park. When he was just 12 years old, the Soviet Union entered the World War II, and Yashin was forced to support the war effort by working in a factory. Despite being a talented ice hockey and football players, the constant work kept wearing Yashin down. At 18 years old, he suffered a nervous breakdown and lost his appetite for sports. At that point, however, one of Yashin's friends at the factory suggested joining the military service. For Yashin, this was salvation. By combining military duties and football, he found his motivation, recommitted to training and was soon noticed by Arkady Chernyshov, a Dynamo Moscow youth coach. Despite joining Dynamo in 1950, Yashin had to wait for his shot. The club's starting goalkeeper at the time was Alexei "Tiger" Khomich, a legendary keeper in his own right. In fact, Yashin was so dismayed by Khomich's excellence that he contemplated leaving football for ice hockey, where he won a USSR cup in 1953. That same year, however, Khomich suffered an injury and Yashin took over the starting spot. It took him less than a year to get a chance to play for the national team; in his debut, the Soviet Union routed Sweden 7-0. During the following four years, Yashin won three titles with Dynamo (1954, 1955, 1957) and led his national team to the gold medal at the 1956 Olympics. Still, it was the 1958 World Cup that truly put Yashin on the football map. His keeper-sweeper mentality, commanding presence in the box, and the ability to read the game were unparalleled at the time, and journalists wasted no time in proclaiming Yashin to be the best goalkeeper in the world. Yashin's best game at the World Cup came against Brazil in the group stage. Led by Garrincha and featuring the 17-year-old phenomenon Pelé, Brazil had no real competition in that tournament. The Soviet team lost the match 2-0, but Yashin prevented a rout with a stellar performance. Though the Soviet Union was eliminated in the quarter-finals by Sweden, Yashin was voted as the best goalkeeper of the tournament. No other goalkeeper in the world -- during his era or beyond -- was as complete a package as Yashin. In addition to his natural athleticism and superb reflexes, Yashin was known for his positioning, stature, and bravery. He was the very first goalkeeper to start focusing on being a vocal presence in the team, constantly shouting orders at defenders and otherwise imposing his authority. After leading Dynamo to another title (1959) and winning the 1960 European Nations' Cup, Yashin experienced a downturn in form. This was particularly noticeable in the 1962 World Cup, where he made several uncharacteristic mistakes against Colombia, which led to the match ending in a 4-4 tie. The Soviet Union was again eliminated in the quarter-finals, losing 2-1 to Chile. Despite being painted by the press as a scapegoat for the 1962 World Cup, Yashin bounced back. In 1963, he led Dynamo to another title and became the first goalkeeper to win the Ballon d'Or. That year, he also made several spectacular saves at the England vs the Rest of the World match. In his biography, Yashin claimed that this game played a big part in prolonging his career. In the first round of the 1966 World Cup, Yashin missed two matches due to a slight injury. Still, he recovered in time to lead his country to its best-ever 4th place finish. Following this achievement, the 37-year-old Yashin was prepared to wind down his career. He retired from Dynamo in 1970, after more than two decades of service. That same year, he traveled to his final World Cup as an assistant coach and the third-choice back-up. Following his playing days, Yashin spent the next two decades in many administrative positions at Dynamo Moscow. Unfortunately, he had many disagreements with club chairman Piotr Bogdanov, whose political clout made Yashin's later life harder than it should have been. Due to the authorities refusing to grant his wife a visa, Yashin was unable to leave the country on many occasions. To this day, Yashin is still the only keeper to win the Ballon d'Or. Throughout his career, he's saved 151 penalty kicks and kept more than 270 clean sheets. In 1967, he was awarded the Order of Lenin -- the highest civilian award in the USSR. In 1998, Yashin was voted the best goalkeeper of the 20th century by the International Federation of Football History & Statistics (IFFHS). He passed away on 20 March 1990.